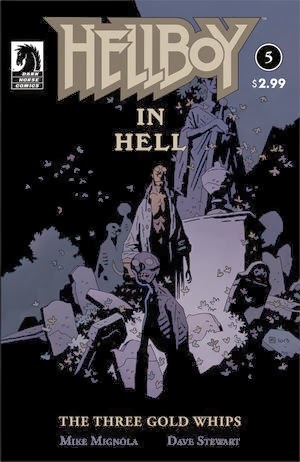 The Fellowship was fortunate enough to obtain a copy of HELLBOY IN HELL #5 from Dark Horse Comics. Mike Mignola writes and draws, and Dave Stewart colors. An old soldier stumbles across Red, looking for a cemetery. Red offers to help, and it turns out that the soldier and two friends sold their souls for magic whips. Our soldier has been offered a second chance, though, and seeks a way out of the bargain. Together they find some answers, the old soldier finds his companions, and Red gets some companions of his own. This turns out to be a very nice, very simple interlude-type story. It gives Hellboy a chance to be a nice guy, and it gives us a glimpse into the workings of Hell and the other goings-on in the chaos. It has the feel of a moment of quiet in a symphony of turmoil and discord. Mignola’s art is filled with shadows and darkness while still showing us Red in familiar yet unnatural surroundings. It blends into the story and adds a depth that many artists aspire to. One doesn’t often think of beauty in Hell, but this book comes awfully close. If you haven’t tried a Hellboy book before now, this would be a really good place to start. 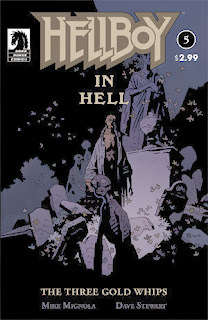 HELLBOY IN HELL #5 is available now at your FLCS and online at darkhorse.com.